We've given a lot of thought to how to increase the number of open seating trips this winter. We understand that in today's difficult economy, it is sometimes quite difficult to collect 4 to 6 people, coordinate schedules, and get trips together. While in past years, we've done few open seating trips in Florida and the Bahamas, this year, we've decided to begin to put trips on the schedule. Trips will be planned well in advance, and be multi-day vacation style trips. We are starting with a series of Bahamas Vacations, from December through April. Over the next several weeks, look for similar schedules of dates in the Florida Keys and Tortugas. As always, if you are interested in these types of trips, please get in touch with us and keep a close eye on our Open Boat Schedule. As we've done every year for the last 5, we will be offering single spots for Giant Bluefin every weekday in December and January, out of Morehead City. These spots are $250 per person and need to be reserved in advance. Swordish day or night, Dolphin,Sails starting to show. They're here!!!! Well the season has begun after the last Noreaster and fishing has started with a bang. Fish have been caught all along the beaches from Avalon to the usual haunts in Cape May. In Avalon the ticket is trolling Stretch 25's along the inshore shoals. Bluefish to 14 lbs have also been mixed in with stripers to 45 lbs. A friend of ours had one 47 inch fish the other day trolling right out front of 30 th street in Avalon on a stretch. In Cape May very big fish to 50 lbs have been caught in the rips and chunking in the Bay. Drifting through the rips with spot has been the key and large fish to 50 lbs have been caught. On the Bay front chunking fresh bunker has been the ticket for fish in the same size range. Getting fresh bunker has been the key however. If you can get them fresh off the boat the better you are. Well Mother Nature allowed us to get out this week and we put a very nice trip together. 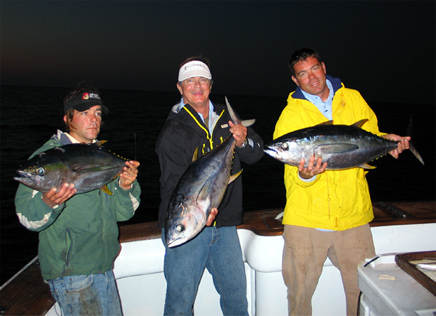 While yellowfin fishing wasn't red hot we did manage to put a very nice catch together of fish up to 30 lbs. The sharks made up for the lack of tuna bites at night as the makos and blue shark action was nonstop. We never went more than an hour without bites in the two nights releasing well over 20 blue sharks and 2 makos to about 150 lbs. For the rest of the season we will be running overnight shark, tuna and sword trips to finish out our canyon run. We were fishing the Wilmington Canyon this week in 65.5 degree water. 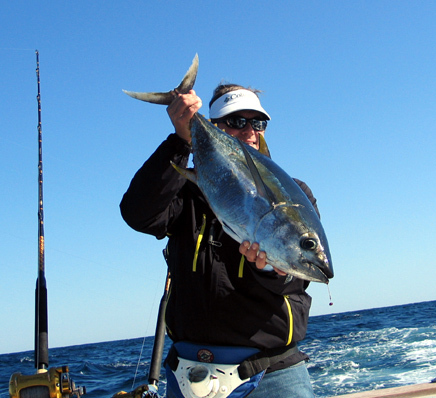 Tuna fishing will still remain good for the upcoming weeks as it seemed the best of the bite was in the Toms Canyon. One boat wound up with 10 fish on the troll while going 1-3 on the chunk for swords. Stay tuned this week as we will be running both striper and overnight trips this week!! The winds from the cold front during the first of the week kept most of us at home. However, the end of the week and the weekend were perfect. There were a few rain showers but it was mostly sunny and 85 degrees. The water temps were 83 degrees, clean green current mostly NE. The sails are biting in the afternoons once the sun gets high and the clouds burn off. The bait of choice … ballyhoos. The reef edge has been very good we are getting our limits in Yellowtails and still catching the big Mangroves on the bottom with cut baits and a knocker rig. 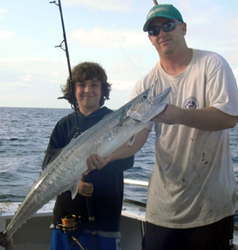 The Cero Mackerels and the King fish are biting rather well. We're catching them on Gotcha lures on 12lb spinning tackle and a fast retrieve. The bait has been plentiful, which sure makes things a lot easier. We have been getting Cigar minnows and Pilchards. We are busy this coming week so we are hoping for a banner time, Thanks! After a nor'easter last week we were eager to get back at it. The weather held us at the dock until Tuesday so we left the dock at 2am hoping to capture Giants. Both Tuesday and Wednesday were slow with only a few fish caught in the whole fleet of which consisted of over 100 boats. Determined to catch one we stayed out two nights and fished three days. The bite picked up on Thursday. We gave it our all unfortunately the third day of fishing was not planned and we had to go in around 1pm to reload. We woke up Friday morning eager to go only to see 30 knot winds and a buoy repot of 10 feet 6 seconds apart. Not ideal fishing weather. Now a low pressure is on us but we hope to get out on Sunday around 5am and the weather outlook shows calmer weather for the week ahead. With the overnight bite turning on, we are going to start putting together open boat overnight tuna trips whenever we get a weather window to run. This time of year, the more flexibility we all have, the more likely to get out and load the boat. ANYONE WHO IS INTERESTED IN GETTING OUT, EMAIL OR CALL US! We will make a list and contact everyone whenever we see a weather window. Hopefully we will be able to get 6 people together and get out. We typically see the windows develop with about 48 hours notice. Email us if you want to be notified of our next trip! Over Under is now on Facebook!!! If you're already signed up on Facebook look for our new group Over Under Sportfishing and join up! It's a great way for Over Under and our customers to be interactive. Share your comments, pictures & videos! And it's a great way to put a Captain's face or a boat to a name. 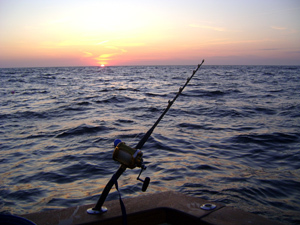 Be sure to check out www.overundercharters.com for more information about fishing & fishing packages. Book your winter fishing vacation with OU!! 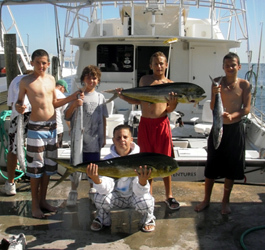 Now fishing in the Bahamas, Key West, Islamorada and Fort Lauderdale!